Full day or half day classroom or online. Preview this workbook immediately. Your ability to successfully communicate with your team members is critical to building strong relationships with your employees. These strong relationships, built upon mutual trust and respect are crucial in helping your team meet and exceed its goals. In addition, powerful relationships built upon effective communication can improve retention, heighten overall productivity, and increase profitability. 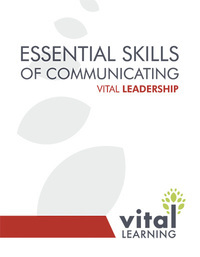 The Vital Learning Essential Skills of Communicating™ program helps supervisors, team leaders and managers ensure that communication with employees is a two-way process. Essential Skills of Communicating teaches managers the latest techniques for developing effective communication skills, thereby improving their performance and increasing the productivity of both the team and the organization. 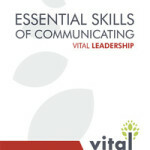 Click the “e” to immediately enroll and begin the Essential Skills of Communicating online course.